74 Commonwealth is located on the south side of Commonwealth, between Berkeley and Clarendon, with 72 Commonwealth to the east and 76 Commonwealth to the west. 74 Commonwealth was built ca. 1870 as the home of Mrs. Jane Hereford (Hallett) Sayles, the widow of Francis Willard Sayles, and their daughter, Laura Larned Sayles. They previously had lived at the Hotel Hamilton at 260 Clarendon. Francis Willard Sayles had been a textile merchant in his father’s firm. He was one of 45 passengers killed on May 6, 1853, when a New York & New Haven Railroad train went through an open draw bridge into the Norwalk River. The land for 74 Commonwealth was purchased from the Commonwealth of Massachusetts on December 13, 1870, by Francis W. Sayles’s estate. Click here for an index to the deeds for 74 Commonwealth. Jane Sayles’s sister-in-law and her husband, Caroline Francoeur (Sayles) Brewer and John Reed Brewer, lived at 72 Commonwealth. Jane and Laura Sayles continued to live at 74 Commonwealth in 1879. 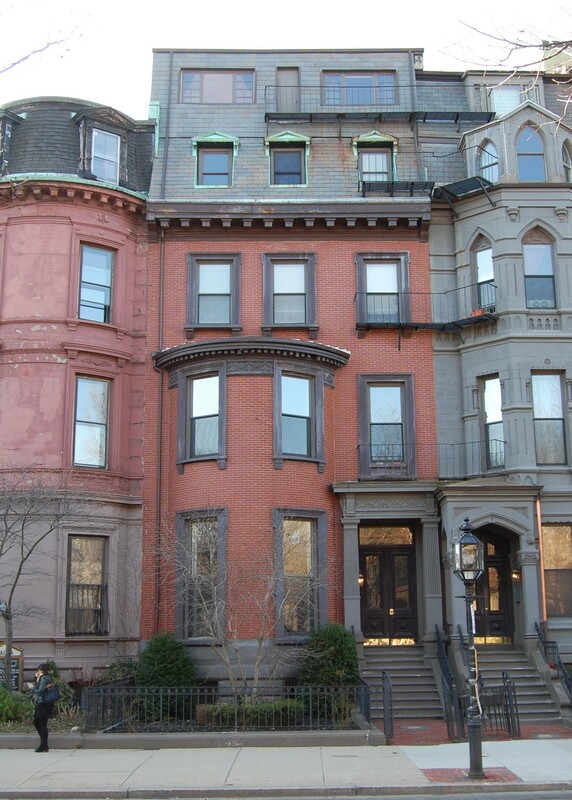 By the time of the 1880 US Census, they were living with Jane Sayles’s brother and sister-in-law, Henry and Cora (Lovell) Hallett, at 31 Chester Square. Jane Sayles, and probably Laura, then moved to the Hotel Vendôme and, by the 1881-1882 winter season, were living at 75 Marlborough. Francis Sayles’s estate continued to own 74 Commonwealth and lease it to others. By the 1879-1880 winter season, 74 Commonwealth was the home and medical office of Dr. Thomas Henderson Chandler, a dentist, and his wife, Elizabeth Caroline (Dowse) Chandler. They previously had lived (and he had maintained his office) at 222 Tremont. Dr. and Mrs. Chandler continued to live at 74 Commonwealth in 1884, but had moved to the Hotel Bristol (northwest corner of Boylston and Clarendon) by 1885. On July 20, 1884, 74 Commonwealth was purchased from Francis Sayles’s estate by Martha (Pierce) Butters, the widow of Isaac Butters. He had been a merchant in Montreal and had retired in 1860 to Stanstead, Quebec. They also maintained a residence in Boston, at 36 Union Park, where he died in May of 1875. Martha Butters had continued to live there with their three children – George Pierce Butters, William Henry Butters, and Mary Isabella Butters – and also to maintain their home in Stanstead. On March 22, 1886, she transferred 74 Commonwealth to herself as trustee for the benefit of the estate of her late husband, which had assumed the obligation of paying her mortgage on the house held by the Massachusetts Hospital Life Insurance Company. On November 12, 1888, she transferred the property to the executors of the estate (of whom she was one). Martha Butters continued to live at 74 Commonwealth until shortly before her death in October of 1891. The house was not listed in the 1891 and 1892 Blue Books. 74 Commonwealth remained the property of the Isaac Butters estate, which leased it to others. By the 1892-1893 winter season, it was the home of wholesale dry goods merchant John Hogg and his wife, Emma (Whiting) Hogg. They previously had lived at 50 Commonwealth. In 1895, they moved to the new home they had built at 280 Commonwealth. By the 1895-1896 winter season, 74 Commonwealth was the home of Mrs. Mary Marvin (Beers) Hopkinson, the widow of Daniel H. Hopkinson. She and her husband had lived in Brooklyn, New York, before his death in 1884. He had been editor and proprietor of the Jewelers’ Circular and Horological Review. Living with Mary Hopkinson at 74 Commonwealth were her father, William L. Beers, and her son-in-law and daughter, Louis Lawton Hopkins and Maude (Hopkinson) Hopkins. Louis Hopkins was manager of the Boston office of the Mutual Life Insurance Company of New York. The Hopkinses also maintained a home in Manchester. On March 5, 1900, the Isaac Butters estate transferred 74 Commonwealth to George P. Butters, William H. Butters, and Mary Isabella Butters, they all having reached the age of thirty (the age specified in Isaac Butters’s will for distribution of the property held in trust for them). All three lived in Stanstead at the time of the transfer. 74 Commonwealth remained the home of Mary Hopkinson and William Beers. Louis and Maude Hopkins moved to 344 Marlborough during the 1903-1904 winter season, but rejoined Mary Hopkinson at 74 Commonwealth by the 1905-1906 season. They continued to live with her and her father until about 1907, when they all moved to New York City (William Beers died in Manhattan in February of 1909). 74 Commonwealth was not listed in the 1908 and 1909 Blue Books. By the 1909-1910 winter season, 74 Commonwealth was the home of cotton broker Philip Gardner and his wife, Virginia (Atkinson) Gardner. They previously had lived in Brookline, and before that at 321 Beacon. They also maintained a home in Dover and later in Manchester, New Hampshire. On July 31, 1913, Virginia Gardner purchased 74 Commonwealth from the Butters family. Virginia Gardner died in July of 1951. Philip Gardner continued to live at 74 Commonwealth until his death in January of 1957. 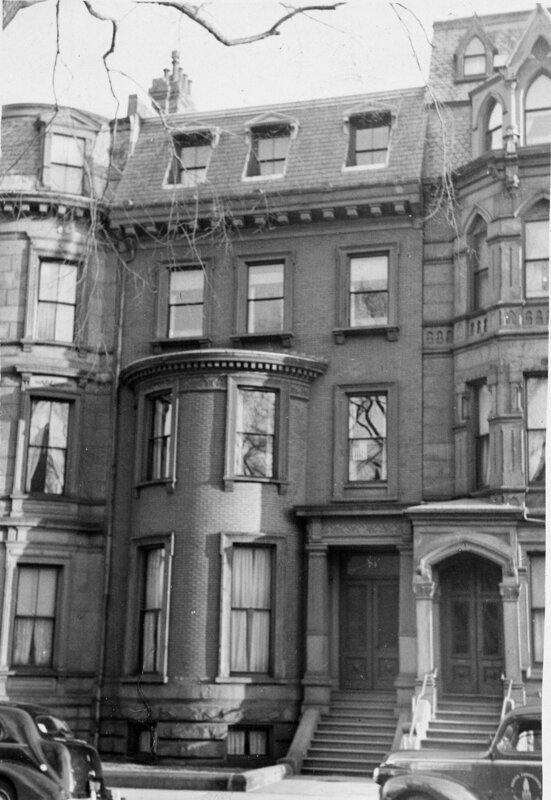 On March 18, 1957, 74 Commonwealth was purchased from the Gardners’ children — Harrison Gardner and Virginia D. (Gardner) Wall, the wife of Albert C. Wall – by the Canadian Club of Boston as its clubhouse. It continued to be located there until about 1963. 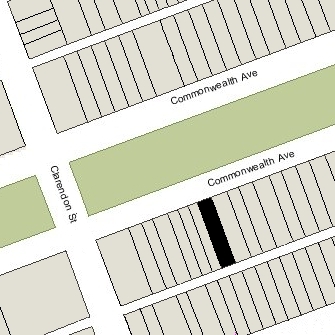 74 Commonwealth was not listed in the 1964 City Directory. On December 5, 1963, 74 Commonwealth was purchased from the Canadian Club of Boston Trust by Nick Haddad, trustee of the Haverty Realty Trust. By 1965, he had converted the property into an apartment house with ten units. On December 30, 1968, the front, top floor apartment of 74 Commonwealth and the roof were damaged by fire. In October of 1970, Nick Haddad acquired 76 Commonwealth and remodeled the top story of that building. Nick Haddad died in February of 2005. On July 11, 2005, the 74 CommAv LLC (Boris Fabrikant, manager) purchased 74 Commonwealth and 76 Commonwealth from the Haddad family. On February 7, 2007, it converted the buildings into condominiums, with twelve units at 74 Commonwealth the and twelve units at 76 Commonwealth, the 74-76 Commonwealth Avenue Condominium.